Scarves are my favorite body warming accessory for the chillier months – the bigger, warmer, more blanket-resembling they are, the better. But swap the knit variation out for a scarf that’s smaller, lighter, silkier, and they make a great summer accessory too. Not only in their physical lightness, but also in their wearability. 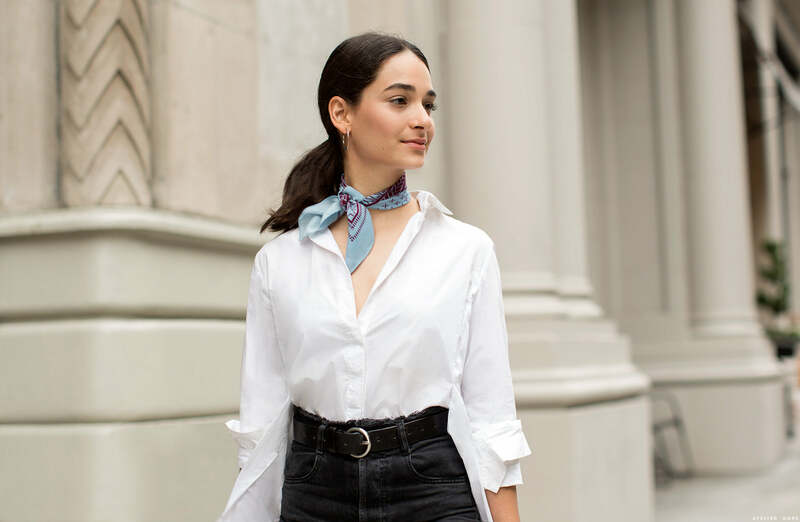 Like many a classic dream women have proven (Diane Keaton, Jane Birkin, Bianca Jagger to name a few), the addition of a neck scarf creates an intentional ease that boasts a subtle sensuality and a hint of Frenchness, non? Their usage isn’t strictly reserved for your neck, either. I love seeing a printed scarf tied around, well almost anything! A wrist, an ankle, a ponytail, a bag…I hold no judgements. A few favorite summer scarves rounded up by our friend and market editor Mallory below! When it's too hot for a) pants b) effort, a playful print (like palms, hello!) adds a bit of character. It would also look great at any tropical themed happy hour you get invited to (wishful thinking). Summer is a great time to experiment with colors you might not wear otherwise. Like hot pink. And while I wouldn't wear this scarf with the one other bubblegum colored garment that I own, I would wear it with any variation of denim. I would also tie it in my hair. Bada bing bada boom. The smallest, lightest, and most neutral of the bunch, it's hard to do this brown DVF scarf wrong. Pair it with a button up shirt that's only partially buttoned up and you've got an outfit for breakfast, lunch or dinner! Bonus points: you can wear it into fall. Je ne sais pas si tu connais la marque Cléo, ni si tu vas aimer, mais je pense que ça va te faire sourire ! Ce sont les écharpes en soie, les plus cute qui existent ! I love scarves too! In winter for warmth and warmer months for a bit of polish to an outfit. Thank you, I would have enjoyed some more ideas on how to wear a scarve. I often feel rather conservative with a silksquare. Thank you for your comment, we love hearing from you. I will definitely keep in mind showing scarves in a variety of ways through out our future fashion posts. I am a lover of the scarf and although I can not show you just yet, there are many ways to wear it. 1. Tightly roll your silk square scarf up from one corner to the other. Then, simply wrap it around your wrist (like a wrist belt!) and tie a knot to keep it in place (knot it on the top side or bottom side of your wrist, depending on your preference). The DVF scarf featured in this story would be perfect for this. 2. The scarf belt (Make sure the scarf is a bit bigger than your typical pocket square sized scarf). Loosely roll it up and slide through your belt loops or wrap around your waist. I like to knot mine at the side of my hip, but you can play with this as you’d like! The Loewe scarf featured here is great for this look. 3. The handbag accessory. This one is super easy – just tie around the strap of your favorite bag! I love doing this with my totes, but mini bags are a good fit too. The A.M. scarf featured here is an ideal option to pull this one off. Looks great would love to know where i could buy it any info ? A lovely scarf is a classic accessory! Wear your favorite skirt a white blouse and add a luxury silk scarf voila instant style ! Look at fashion photos of the greatest fashion icons “What do they have in common?”- a classic scarf . Scarves will help you develop your own style . Love scarves all year long. Where is the black belt the model is wearing in the photo from? Thanks! Love the scarves! But who made the white shirt? Yes, I’m still in love with the scarf/bandana trend! They look so chic, and the instantly add something to your look!